The first time we were in Great Falls, we missed the Charlie Russell Museum out of sheer ignorance, and had to spend the whole trip listening to other people talk about how great it was. The desire to see the museum was one of our main reasons for returning for a second visit to Great Falls. While my expectations were high, I was even more impressed than I expected to be with the size and beauty of this first-rate museum, which showcases the life and work of Charlie Russell (1864-1926), the consummate artist of the American West. Russell arrived in Montana at age 16, the disaffected son of a prosperous St. Louis family. His folks figured a summer out west would cure their boy’s restlessness and get him ready to enter the family business. Instead, Russell immediately fell in love with the people and landscapes of the West. He immersed himself in the life of a working cowboy. A few years later, he also awakened to a desire to draw and paint what he was experiencing. The museum’s numerous galleries showcase Russell’s work from these early efforts through the flowering of his art and international success. Russell’s career spanned decades, and it’s safe to say that he created a unique and personal body of work that documents a way of life that was already vanishing when he arrived on the scene. Far from mere “cowboy pictures,” the work of Charlie Russell is not only amazingly technically proficient, but full of deep humor, empathy, and pathos. 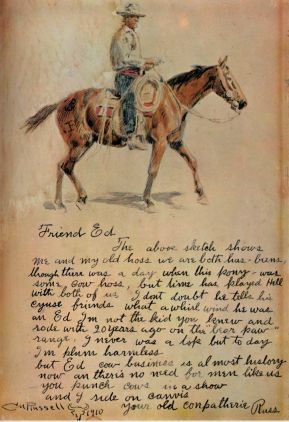 One of Russell's delightful letters includes a self-portrait of himself on "Red Bird." Russell wrote with a sense of humor rivaling that of Mark Twain. We spent hours viewing hundreds of Russell’s great story paintings, as well as little sculptures, whimsical illustrations, and his wonderfully humorous letters (what a delight it must have been to be this man’s friend!). We also learned about the critical role his wife Nancy played in his success (no businessman, he). In addition, we viewed the collection of works by O.C. Seltzer, temporary exhibits of the paintings of Blackfeet artist Gary Schildt and sculptor Bob Scriver, and a great collection of firearms. Best of all, the museum also includes Russell’s small but beautiful home and the log cabin studio in which he worked. His wife had the studio built next door to get him out of the house. His collection of Indian and western artifacts, paints, equipment, and the rustic space where he painted were much the same as he left them when he died. It is easy to feel very close to Russell here, and a tour of the Russell Museum is easily worth half a day of your vacation, at least — the luxury of a whole day, if you can swing it. This brings back happy memories. In the 90s I worked in the education department at the Autry Museum in California. 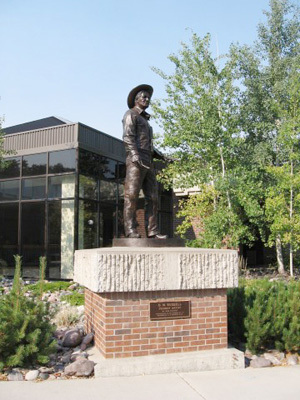 At the time they had a modest but lovely collection of Western art — some paintings by Russell, Albert Bierstadt, Maynard Dixon, and some Frederick Remington bronzes, among other items. Being a “museum teacher,” I could wander around the gallery (and “accidentally” amble into the Native Arts gallery…) without any supervisors wondering why I wasn’t at my desk — I was doing research! It was pretty fun being a Westerner working at a brand-new Western heritage museum. Russell’s works defined our own sense of self in this part of the country — his influence can be seen in so much of our iconography, even the Marlboro Man — and, to me, still illustrate what it feels like to come from out west.